One of our most beloved Autumn traditions is pressing apple cider. Some we refrigerate to drink in its sweet, raw, unpasteurized form. The rest we ferment into hard apple cider. 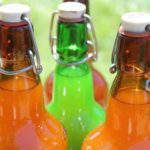 Today my husband Brian joins me to share how to make hard cider in just a few easy steps. I remember first learning about hard cider from a wonderful, story-filled British forester who recalled making and buying cider or “scrumpy” in his youth. Back then, in England, cider was far more common than beer, before the big multi-national beer corporations moved in. Here in the U.S., cider had almost disappeared commercially, though now craft hard cider is making a big comeback. Delicious hard apple cider is easy to make at home, in just a few simple steps. Today we’ll walk through the fermentation process of making hard apple cider with wild yeasts. In a few weeks, we’ll share part two, racking and bottling your hard cider. Finding apples to press into cider is usually pretty easy, with a bit of sleuthing around town. Look for trees dropping their fruit in someone’s lawn and ask politely if you can pick some of them. Most of the time, they will be happy to have you clean up the whole tree (and in their mind, the mess). 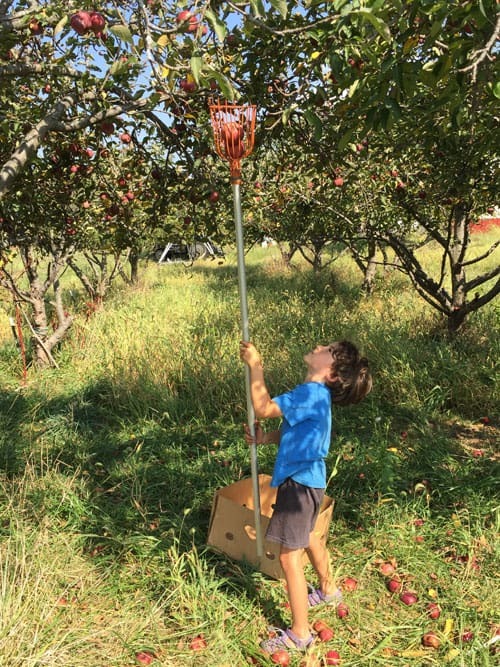 Alternatively, you can u-pick apples at a local orchard – ask if they allow you to pick up windfall apples from the ground for a reduced price, or for free. When picking ground apples, look for ones without rot or obvious bruising. We usually give all of our cider apples a rinse in water before pressing. 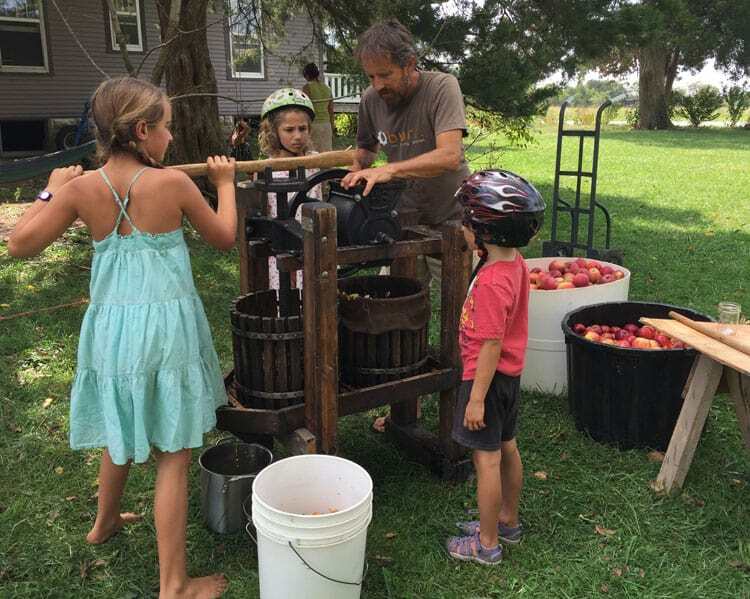 The hardest part of making cider is getting the juice out of those apples, and for that you need a cider press. To make it affordable, we co-bought this high quality cider press together with four other neighbors, since you really only need to use it a couple times each in the fall. I have a friend who rents his each year from a local rental place. And there are DIY plans for making your own press, if you have that inclination. Here’s a quick video that shows the apples being ground to a pulp, the cider being pressed, and then us pouring the cider into a carboy (which you’ll learn about in Step Four). The great thing about acquiring equipment for making hard cider is you can use it for years and years, and for other brewing projects. What Equipment do I Need to Make Hard Apple Cider? You’ll need a vessel to hold the cider and an air lock to seal it. 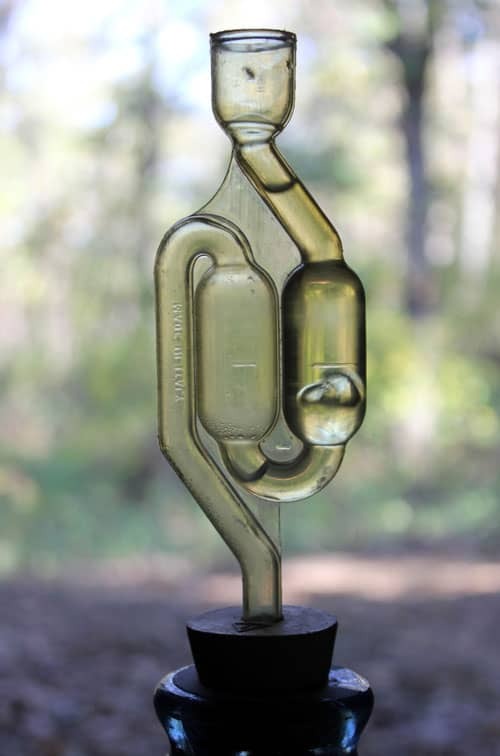 An air lock is simply a device that allows gas to bubble out but won’t allow any air back in. 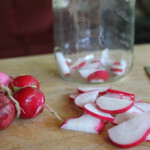 One gallon jars can be used for small batches, but if you want to ferment larger quantities, you should buy a 3 or 5-gallon carboy from a home-brewing supply store. 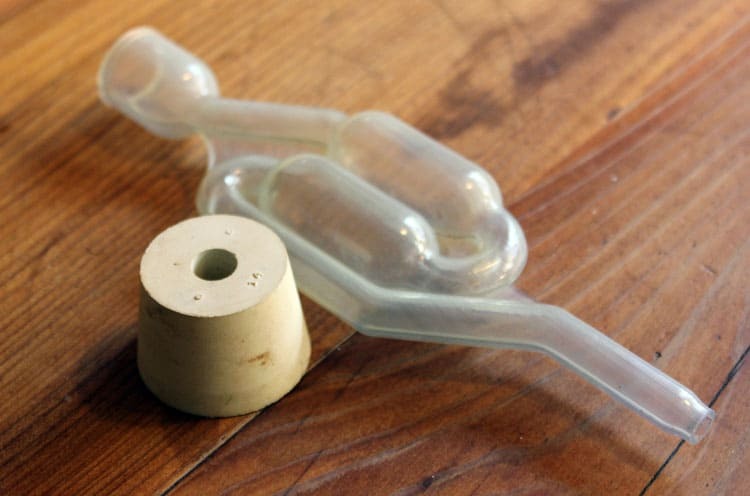 You will also need an airlock and the proper size stopper with a hole for the airlock. Some books recommend sterilizing all of your cider making equipment, but I don’t like using bleach or other chemicals, so a good cleaning with hot soapy water and rinse is all we tend to use. 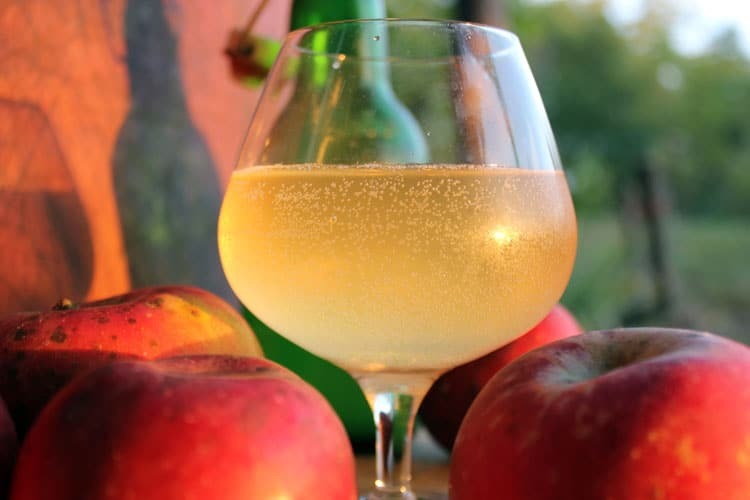 Similarly, some resources suggest sterilizing your fresh cider with sulfites like Campden tablets then add commercially produced wine yeast, and acid balancers and yeast nutrients etc. to make your hard cider. You could do this, like commercial producers and vintners do in order to maintain consistent marketable results. But we’re OK with yearly variations in our cider, and we love that we don’t have to purchase a single thing for this beverage, and that we are utilizing the wild yeasts and local terroir that will make this cider wholly unique. Remember, humans have been brewing cider and wine ever since we started picking wild fruit, without any high tech equipment. 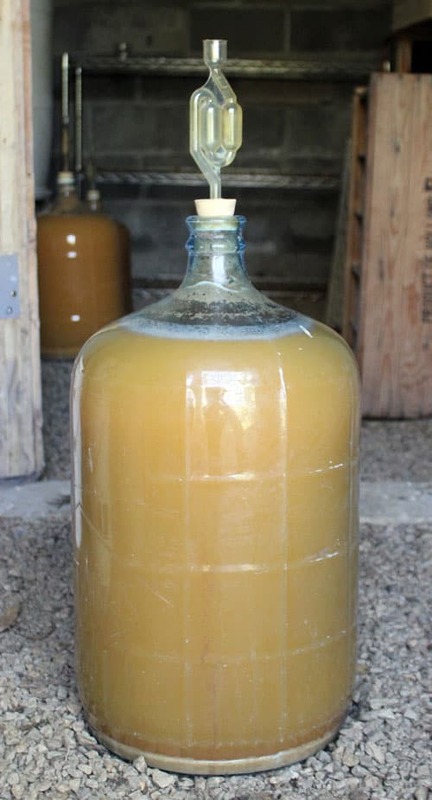 Now that you have your beautifully sweet, raw, unprocessed cider, and the equipment you need to turn it into hard cider, it’s time to start fermenting! We pour the cider right from the press directly into the carboy though a strainer and funnel, as you can see in the video above. 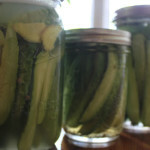 When almost full, we pop the airlock on and stow it out of the way in a cool spot in the house out of direct sunlight (we place it in our homestead root cellar). Then … just do nothing. Organic or unsprayed apples, like grapes and other fruits, grow with naturally occurring yeast right on their skins, so your fresh cider will start fermenting almost immediately. (Which means those microscopic yeast cells will start “eating” the sugars in the juice and “excreting” alcohol and carbon dioxide gas). 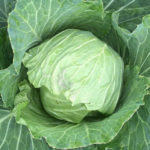 The initial fermenting process will create bubbles and foam caused by the release of carbon dioxide, which can come up through the airlock and sometimes clog it, (especially if you haven’t strained out larger apple chunks), so monitor this during the first few days, and clean the foam out of the airlocks. Alternately, you could use a large diameter hose the size of your carboy jar opening (sometimes called a blow-off tube) fitted snugly into the opening with the far end curved down into another smaller jar of water, that allows the foam to bubble out safely without clogging for the first few days, and then you can install the air locks. And that’s it! Hard cider is on the way. 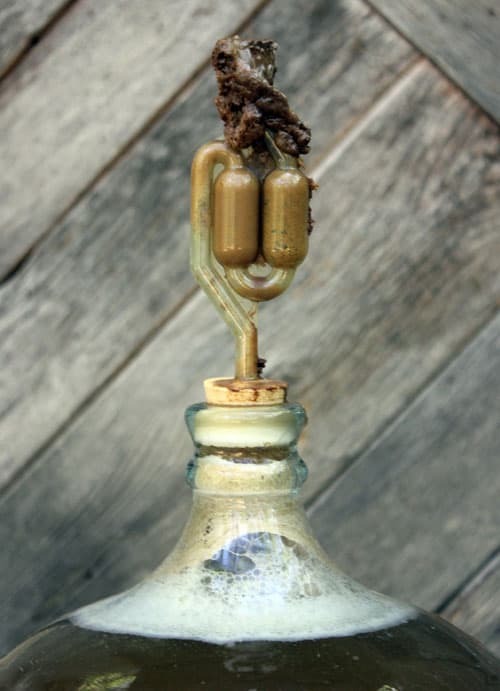 Now all you need to do is wait for the bubbling to slow and stop, signifying that most or all of the sugar left in the juice has been digested by the yeast, and converted into alcohol (and CO2). 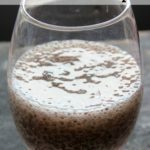 This could take several weeks or up to several months, depending on a variety of factors including temperature, initial sugar in the apples, yeast vigor, etc. Stay tuned for Part 2 in a few weeks, which will walk you through the steps of racking and bottling your cider! Do you love the taste of craft hard cider? We'll show you how to make hard cider at home in five easy steps with no additional ingredients required! 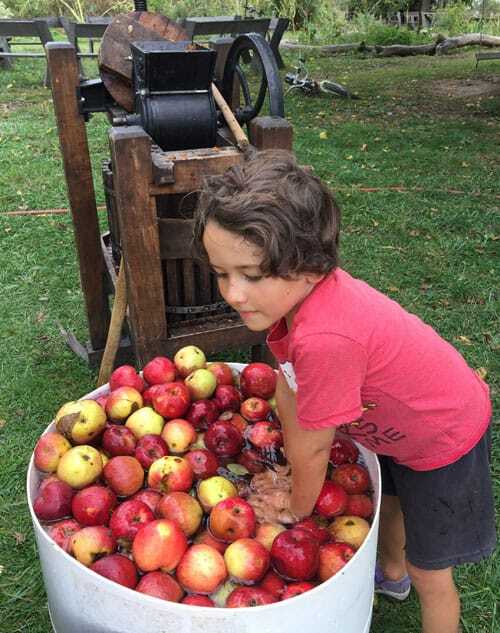 The hardest part of making cider is getting the juice out of those apples, and for that you need a cider press. To make it affordable, we co-bought this high quality cider press. My video shows the apples being ground to a pulp, the cider being pressed, and then us pouring the cider into a carboy. Today I will try your Hard apple cider though. Thank you for a great 2017 with all your amazing recipes! !Your recipes made me famous in my family and church community.